Getting from Manila to Coron by either air or sea. Philippine Airlines flies to Busuanga airport daily. From the ariport it is 30 minutes by van to Coron town. Cebu Pacific Air also flies daily to Busuanga. Super ferry : sails to Coron once a week on Friday afternoon, arriving early Saturday morning. Upon arriving Coron town, Castaway is 15 minutes by boat to Uson island which is fronting the town. It is centrally located to visit the various attractions in Coron such as Kayangan Lake, Barracuda lake, Twin Lagoon, CYC, Siete Pecados and Makinit hot spring. 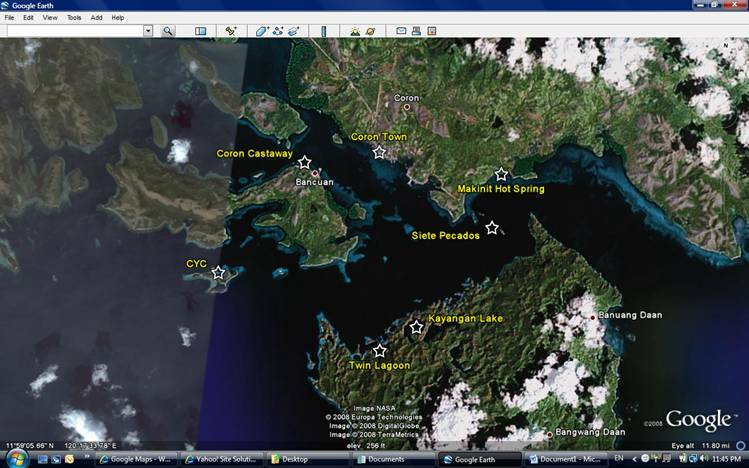 Below is a map compliments of Google earth.